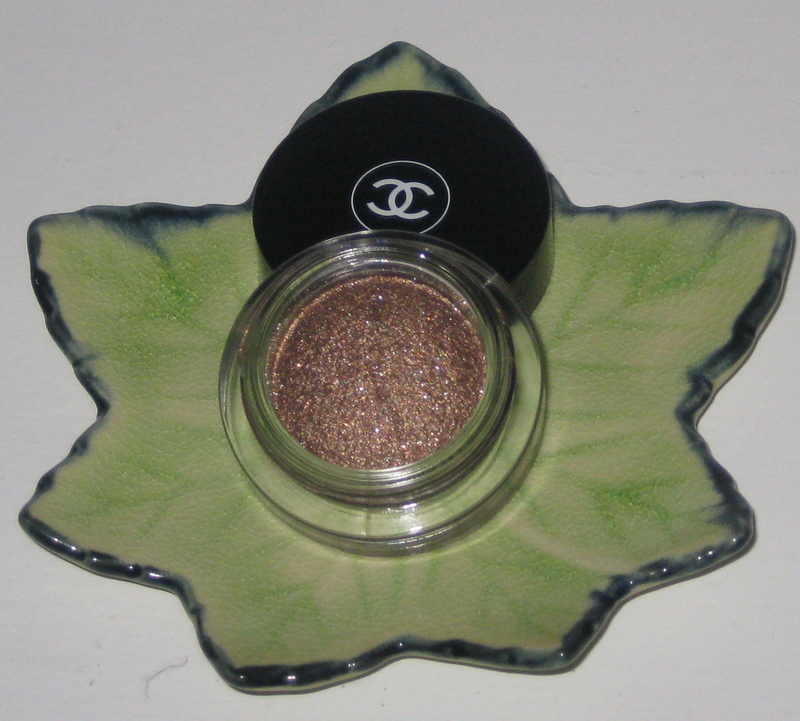 Chanel Initiation Illusion D’Ombre Eyeshadow review, swatches, comparisons. I am not one to go out and hunt down limited-edition products. My cosmetic defense mechanism kicks-in and reminds me, repurchase is futile. 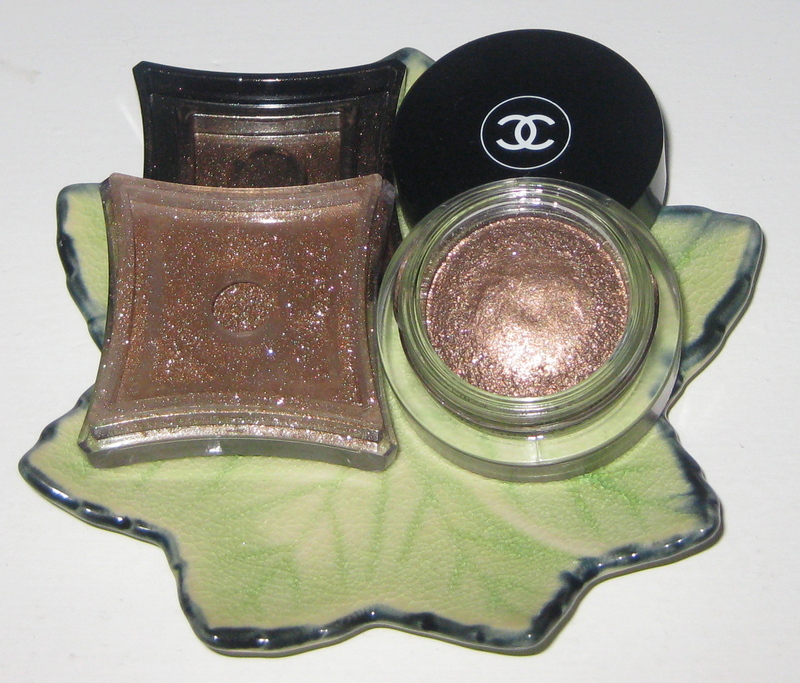 However, when Chanel Nuit Infinie de Chanel Collection started appearing on blogs and reviews started flooding in, I knew Chanel Initiation Illusion D’Ombre ($36 US/ 4g) was the one color in this LE collection that was worth the pursuit. Mind you, it took four major department stores to track down this color. The things I will do for this blog. Was it worth it? You’ll see…..
Beautiful antique gold color with micro-fine gold, copper and silver sparkles. What a combination! Price/amount ratio is a good value. Initiation reminds me of my beloved Illamasqua Ore Pigment. The sparkles are lightweight and abundant. 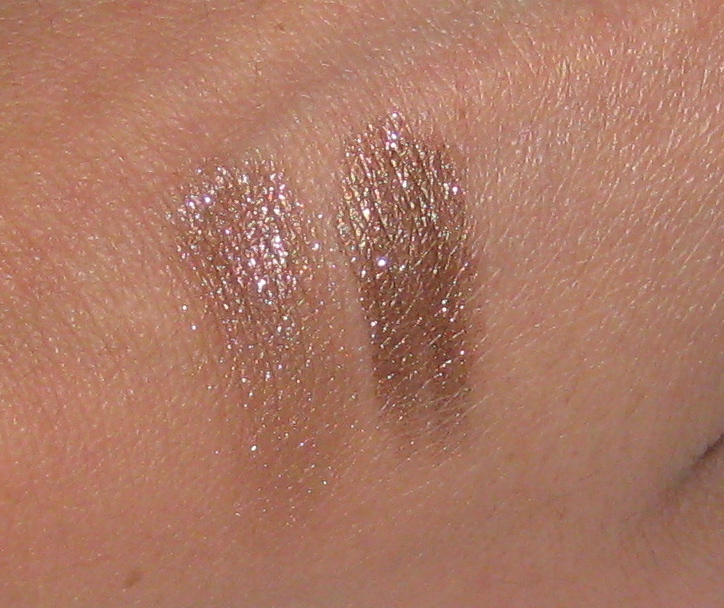 Right: Chanel Initiation Illusion D’Ombre. Initiation has a very faint brown base, color build-up is not possible. The color seems to be consisted of pure sparkle. The formula is not on par with other Illusion D’Ombre (reviewed here). The sparkle’s texture is not as densely packed as Vision or Fantasme. Initiation’s performance reminded me more of MAC pressed pigments (not good). There does not seem to be a sufficient binding agent within the formula to allow the sparkle to adhere to the lid. The fallout is ridiculous! This particular color seems to have had issues with shrinkage (as seen on many other blogs); presumably due to the drier texture and lack of a dense color base. After one hour the sparkles migrated from my lids to my face. 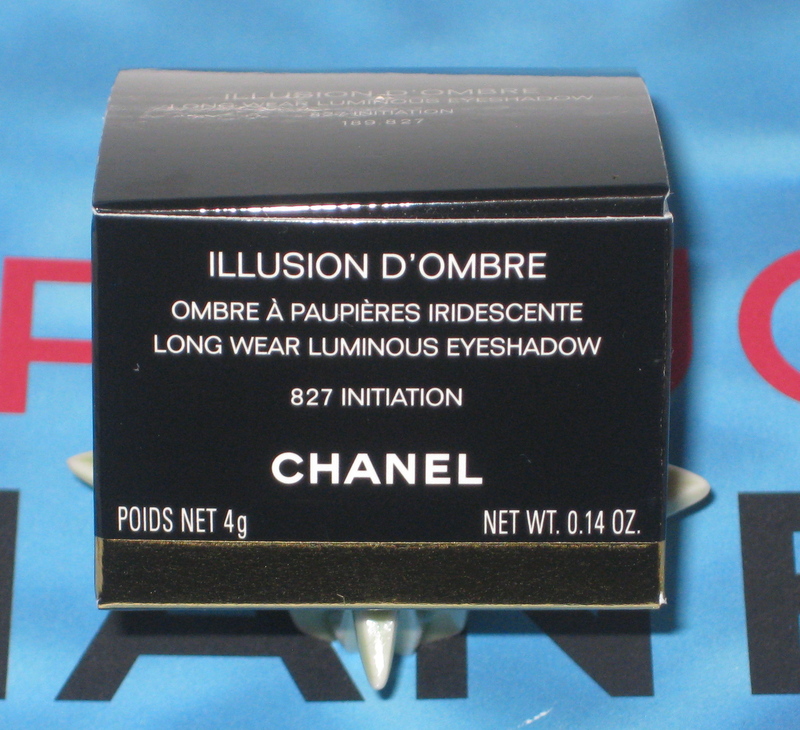 Chanel Initiation Illusion D’Ombre over Shu Uemura M895. I had to place Chanel Initiation over a matte color, otherwise the camera would not have picked-up the color. As stated earlier, I was so excited to get this color solely because of its resemblance to Illamasqua Ore Pigment. 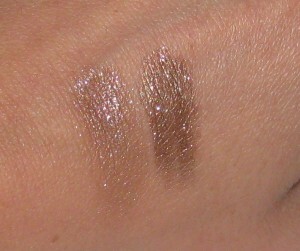 Swatch: L-R: Chanel Initiation Illusion D’Ombre and Illamasqua Ore Pigment. 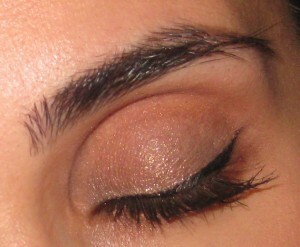 Illamasqua Ore Pigment with Sephora Glitter brush. My love for Ore Pigment has sparked countless recommendations. Every time I wear Ore, people want to know what it is and how to apply it best. Ore Pigment (or any pigment for that matter) can be applied with ease and zero fallout with the Sephora Glitter Silicone Brush (discontinued but, MUFE and E.L.F both have a version of this brush in their line). Simply dip the brush into the pigment, tap off the excess and press the brush onto your lid. My only criticism with Ore Pigment has to do with the packaging. I find the container impractical and cumbersome. Hey ho…the actual pigment inside is stellar! Oh how I wish Initiation had Ore’s pigmentation, longevity and adhesion. I applied Initiation with my ring finger and then gently patted the color across my lid . The hand swatch for Chanel Initiation was quite promising, but the color pay-off and performance on the lids was beyond disappointing. Chanel Cosmetics can be found in any department store. Macy’s, Bloomingdales, Neiman Marcus, Lord & Taylor, even Century 21 and Chanel.com. Currently, chanel.com does not carry this color, you will be able to find Initiation in person at Saks and online at Nordstrom.com. 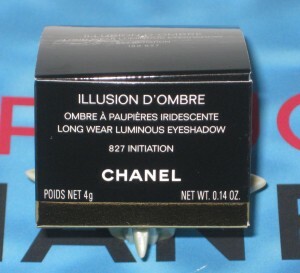 Makeup would tell you to skip Chanel Initiation Illusion D’Ombre. This particular color does not adequately represent the Illusion D’Ombre range. For my needs, this color did not live up to my expectations; I wanted noticeable color with some sparkle. Certain people’s penchant for Initiation will be due to it’s subtly, although the fallout will be a deal breaker for many others. For my part, I will be exchanging Chanel Initiation. In the meanwhile, Maverick “if you feel the need, the need for speed” (Top Gun bro) then get your antique gold/bronze fix with Illamasqua Ore Pigment. You will not be disappointed. Be well and stay safe.